Block Head is one Renegade who really lives up to his name! Even among some of Cy-Kill's thicker subordinates, Block Head is easily the thickest. 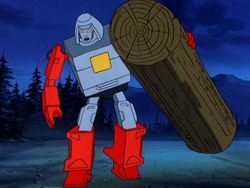 As bereft of intelligence as he is of culture, Block Head is still appreciated by Cy-Kill for being dumb enough not to question orders putting him in harm's way, and tough enough to survive the fallout. 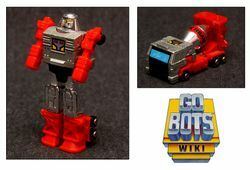 A repackaged import of the Machine Robo Mixer Robo toy, GoBots Block Head converts from robot to cement mixer. 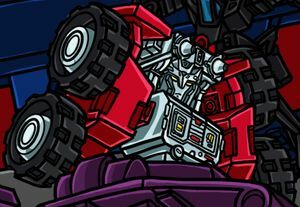 Block Head's Cybertronian-style body in the "Cataclysm universe" is modeled on Combiner Wars Mixmaster. This page was last edited on 5 May 2018, at 15:51.